Jared Kushner and Ivanka Trump are the self-styled Prince and Princess of America. Their swift, gilded rise to extraordinary power in Donald Trumps White House is unprecedented and dangerous. 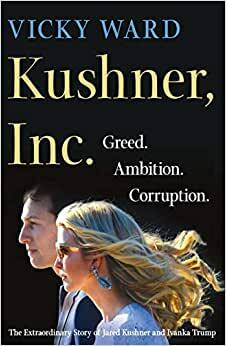 In Kushner, Inc., investigative journalist Vicky Ward digs beneath the myth the couple has created, depicting themselves as the voices of reason in an otherwise crazy presidency, and reveals that Jared and Ivanka are not just the Presidents chief enablers: they, like him, appear disdainful of rules, of laws, and of ethics. They are entitled inheritors of the worst kind; their combination of ignorance, arrogance, and an insatiable lust for power has caused havoc all over the world, and may threaten the democracy of the United States. Ward follows their trajectory from New Jersey and New York City to the White House, where the couples many forays into policy-making and national security have mocked long-standing U.S. policy and protocol. They have pursued an agenda that could increase their wealth while their actions have mostly gone unchecked. In Kushner, Inc., Ward holds Jared Kushner and Ivanka Trump accountable: she unveils the couples self-serving transactional motivations and how those have propelled them into the highest levels of the US government where no one, the President included, has been able to stop them. Vicky Ward is a New York Times bestselling author, investigative reporter, and magazine columnist. She is the author of the bestselling books The Liars Ball: The Extraordinary Saga of How one Building Broke the Worlds Toughest Tycoons (Wiley) and The Devils Casino: Friendship, Betrayal and the High Stakes Games Played Inside Lehman Brothers (Wiley). She is an editor at large at HuffPost and HuffPosts long-form magazine, Highline, as well as at Town & Country magazine. She was a contributing editor to Vanity Fair for eleven years, where she covered politics, finance, art, and culture. 226 people found this helpful. 204 people found this helpful.